My latest edition to my Spanish army are these unusually garbed soldiers, Valencian Cazedores. 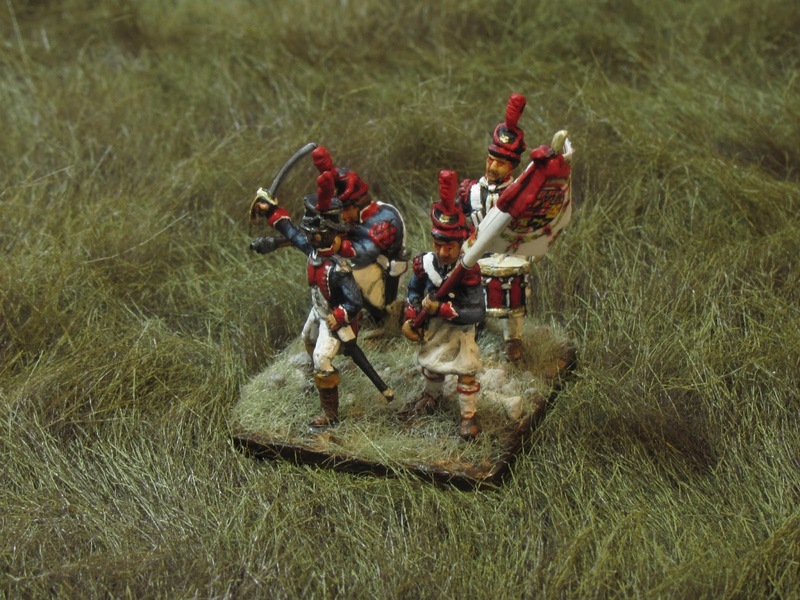 They were another gift in the HaT Spanish Guerrillas sets that I had purchased in order to incorporate the top-hatted figures into three units of Spanish militia circa 1808. Also in this set were four figures that with a bit of research proved not to be guerillas at all but Valencian cazedores. 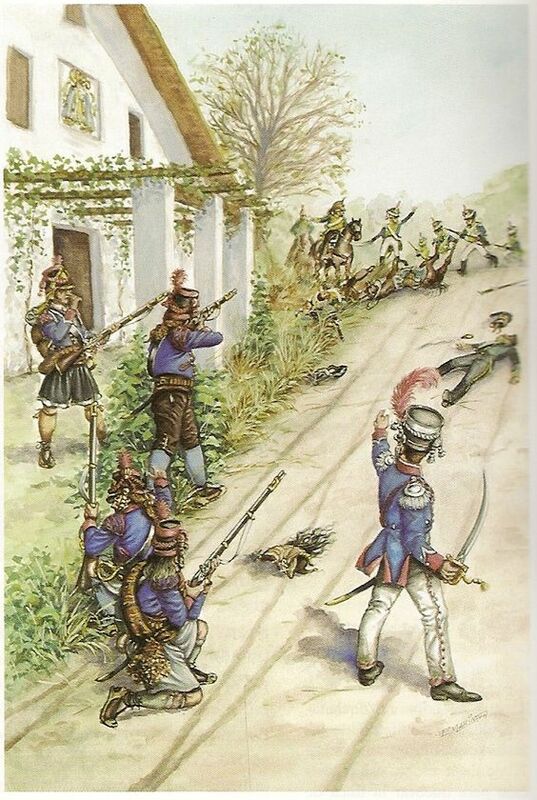 The Valencian cazedores were raised in 1808 as part of the massive recruitment undertaken under the auspicies of the Spanish Junta in response to Napoleon's seizure of Spain. 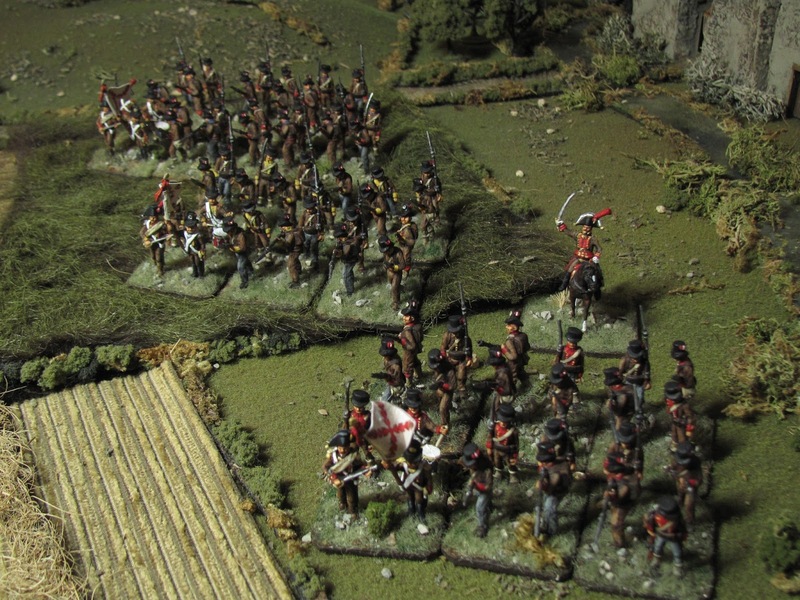 The Cazedores were one of two regiments raised (the 1st and 2nd) of light infantry, the first serving from 1808-15, and the second 1808-12. 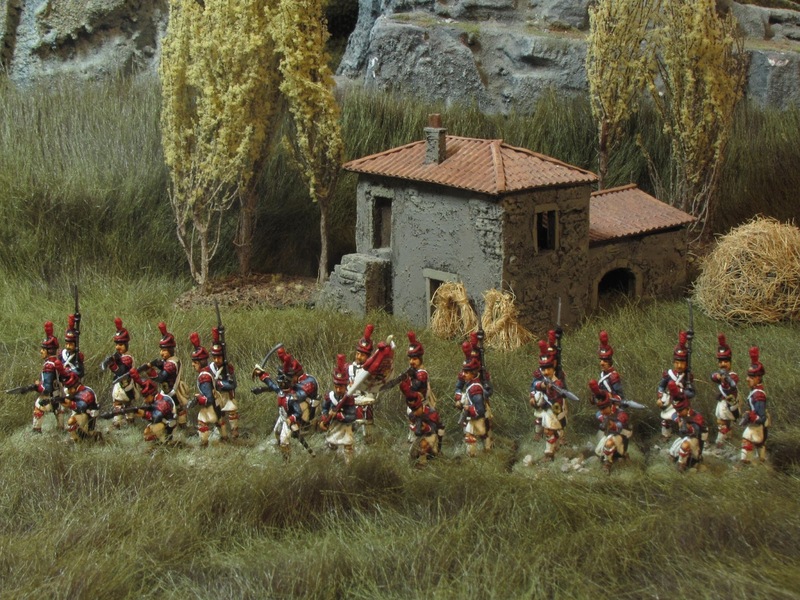 I was originally somewhat confused by reference for these Valencian Light Infantry but this image is almost certainly based on the Voluntarios de Valencia, one of the earlier Spanish Light Infantry regiments, part of the pre-war establishment, in this case established in 1794. 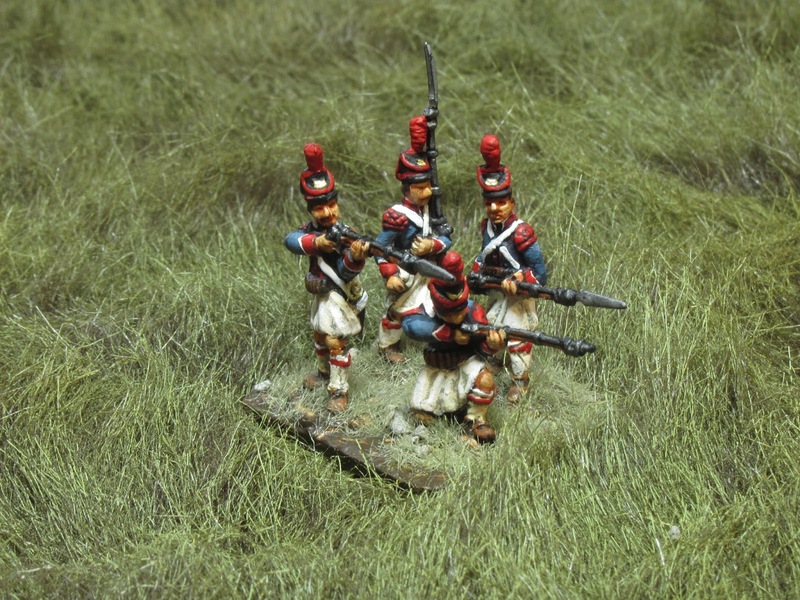 Reference was sparse for these guys - a few larger scale figures I found on line but the only illustrated reference I could find was the image below. 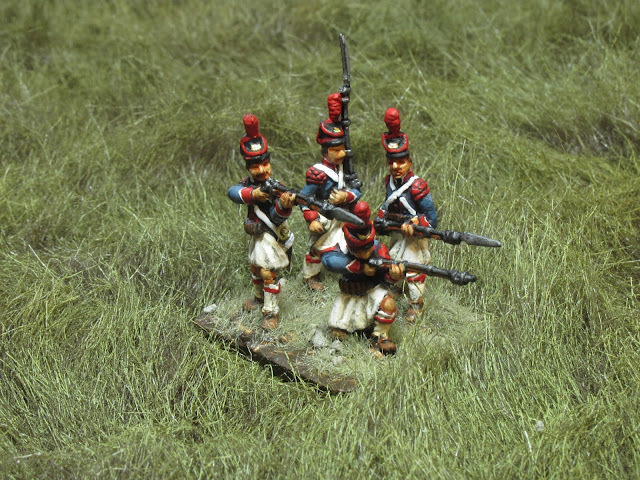 These soldiers seem to be wearing a hodgepodge of clothing including the "peasant pants" or skirt seen worn by the HaT figures. With only four figures in the HaT set there wasn't a lot of pose variety, and no command stand figures, so I converted two of the marching figures into a drummer and standard bearer and used a French light infantry figure with some embellishments to create an officer similar to the one in the reference above. Command stand with converted drummer, standard bearer and officer. These are the four figures included in the HaT set. The faces were a bit featureless and there was some flash but the detail was nicely elevated making for easy painting. Another gift from the Guerrilla set were drovers for my Spanish limbers. The Spanish were unique (I believe) in that their drovers and limbers weren't army establishment but contracted from the civilian population. 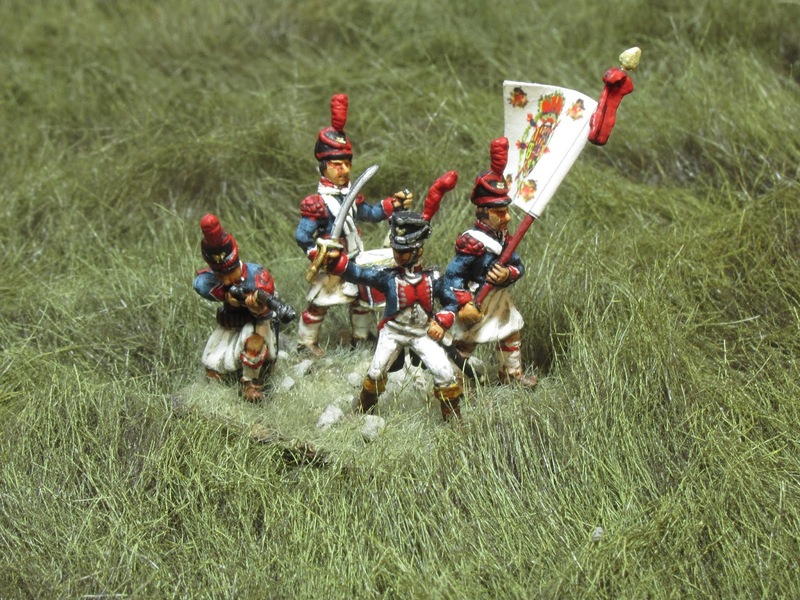 One of the guerrilla figures from the HaT set, armed with a sword, neatly converted into drovers, with a head swap and arm relocation giving some variety. 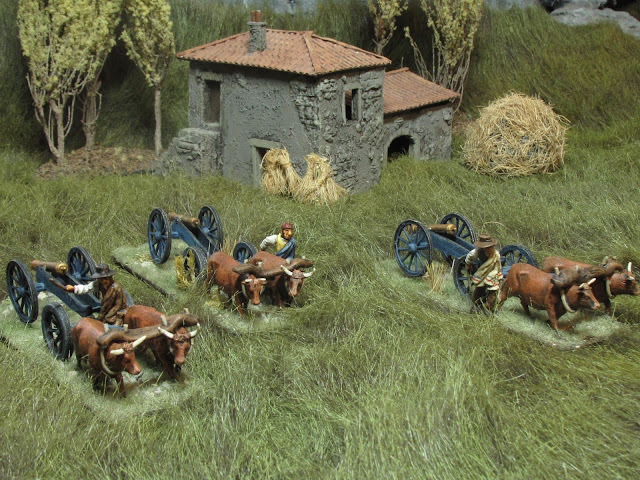 The limbers I had built previously using Pegasus cattle and some converted old Airfix French limbers with scratch built yokes. 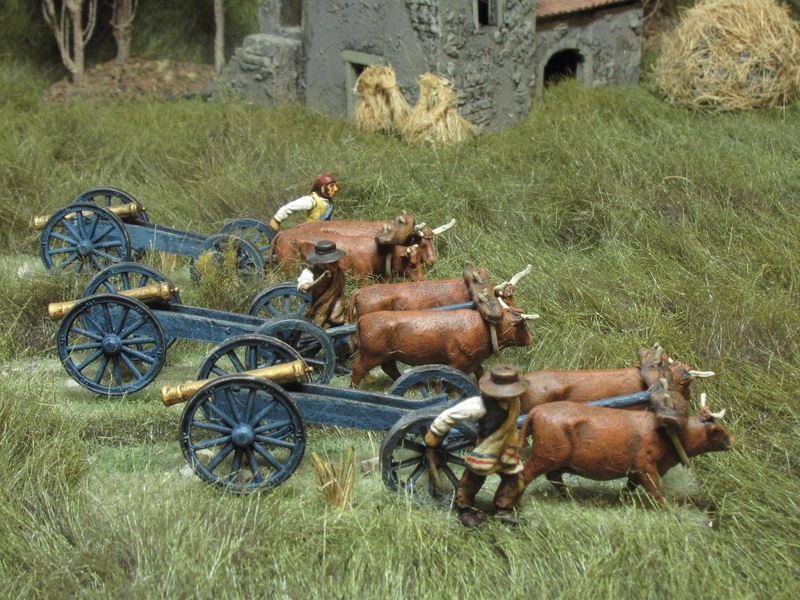 I would be curious to know how well the Spanish managed to move and relocate their artillery under fire using civilian drovers! Wow, wonderful figures and photos!